As a reporter I covered more than a few strange stories, and I learned that even in the smallest of towns, a lot of dark things happen. 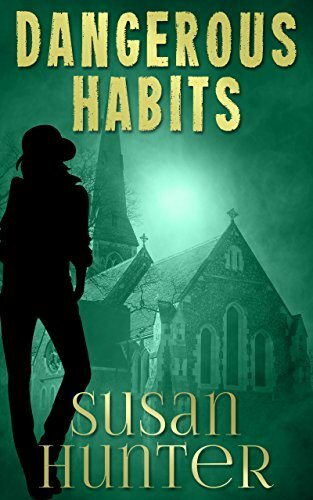 Dangerous Habits was inspired by that knowledge, but is completely fiction. Sometimes a character springs to mind fully formed, complete with physical characteristics, defined personality and individual quirks. More often I create characters that draw from bits of behavior that I observe, or conversations I overhear, or things that I read. None of my characters are based on a real person, though I try to make them all realistic. I’ve seen a lot of really ugly things happen in my 10 years as a reporter. Good people suffer, bad people thrive, and it all seems pretty random to me. A friend of mine keeps telling me I have it wrong. Life is a tapestry woven with the threads of all that is good and bad in each of us. But in this world, we’re limited to viewing it from the underside, full of knots and tangles and hanging threads that seem to have no connection or purpose. It’s only after we reach the next world that we can see how everything fits together in an amazing, beautiful picture. Maybe. But what I know for sure is that when I started to pull on one of those tangled threads last spring, a lot of lives unraveled, and I almost lost my own. It was pretty hard to see a Grand Design in that unholy mess. My name is Leah Nash. I’m a good reporter and an even better smartass who, as it turns out, isn’t all that smart. That’s why instead of driving around sunny Miami chasing leads, I was slip-sliding down a riverbank in Himmel, Wisconsin, on a particularly nasty early April day last year. My assignment—and I had no choice but to accept it—find some wild art to fill a gaping hole in the front page layout of the Himmel Times Weekly. Wind and sleet riled the normally placid Himmel River into foaming whitecaps. Miles upstream the force of the current had uprooted a dead oak and carried it on a collision course with the dam supplying hydroelectric power to the town of Himmel. Now city crews in two boats were trying to harpoon the tree with hooks and ropes before it wreaked havoc at the dam. I was hoping to get some action shots before deadline. When I reached the bottom of the steep incline, I saw that a massive winch had been set up to haul the tree in. As I shifted my camera bag from my shoulder, a fresh gust of wind sent an icy trickle of water down my neck. “I’m gonna kill Miguel.” Miguel Santos is the other staff writer at the Times and a much better photographer than me. It was his turn to follow up on the scanner chatter that had alerted us to the renegade tree photo op, but he’d begged off with a dead car battery. So, I was the one shivering and reaching for the telephoto lens. “Whatsa matter, Leah, Ricky Martin afraid the rain will mess up his coiffure?” Darmody asked, pronouncing it cough-your and then guffawing. “Quiet, would you, Darmody?” I said, though I was more distracted than annoyed. The boats were already halfway to the tree by the time I got the lenses switched. Dale Darmody, the Himmel Police Department’s oldest but not smartest cop, was still droning on. “That tree must be 80 feet long. And lookee all that stuff hangin’ from the branches. Musta picked up a load of crap goin’ downriver.” His chapped red nose wiggled as he talked. Little tufts of gray hair sprang from it and from his ears. His watery blue eyes blinked in the wind. “Darmody! Make yourself useful and help Bailey with the winch.” The order came from Darmody’s boss, David Cooper, now striding toward us. “Right, LT,” said Darmody, scurrying off. “Crowd control,” he said, clapping his hands together to warm them and glancing up at the high bank above us. “Right.” The nasty weather meant only a fraction of the usual gawkers were on hand, and all were neatly contained behind yellow police tape. But the faithful few who kept watch were about to be rewarded. A sudden shout from the water signaled the tree had been hooked, and we both turned our attention to the river. As the winch roared to life, I focused the camera and started shooting pictures but soon realized I needed a better angle. I glanced around for a higher vantage point then spotted a half-dead birch jutting from the bank a few yards downstream. I sprinted behind the winch and shinnied up to a Y-juncture in the tree. It wasn’t a very sturdy perch, but I only needed it for a minute. I looked through the lens and zoomed in. As I did, the winch groaned against the weight of the tree and gave a banshee wail. The men in the boats pushed hard at the trunk with long poles topped by metal hooks. The tree began bobbing up and down and rolling side to side slowly at first then picking up speed. The pressure from the poles, the pull of the winch, the force of the current and its own growing momentum caused the tree to rock faster and faster. It began to buck, one side dipping low in the water as the other raised higher with each rolling motion. Poles dropped and motors roared as the boats pulled away from the wake of the giant tree. With a lurch the part of the oak that had been underwater shot upward. Branches that had been submerged lifted toward the sky. Hanging from one of them was what looked like a flapping sail. But as the tree bounced up and down more slowly, the horrifying truth became clear. “Somebody’s caught, someone’s on that tree!” came a shout from the onlookers. Tangled in the web of branches was a body bobbing up and down in awful rhythm as the winch groaned slowly on and the oak neared the shore. The crews moved back in quickly to steady the tree and free the body. By the time they pulled it into one of the boats, someone had already radioed for EMTs. The other crew and the guys on the bank continued to maneuver the tree to shore, but our eyes were on the boat speeding in with the unknown victim. I scrambled down from the birch and watched in silence with everyone else as two men carried the body to a grassy spot a few feet from where we stood and laid it gently on the ground. Rivulets of dirty river water ran down a narrow face above a once white collar now muddy and askew. Wide open eyes didn’t blink as sleet fell on their sightless stare. The veil that had once covered curly black hair was gone, and the gray color of the long robe had gone black with water and river grime. For a minute no one said anything. Then an anonymous voice broke the silence. Two EMTs came up behind me with a stretcher. “Ma’am you’ll have to get out of the way.” Nodding, I took a step backward. Stumbled. A hand under my elbow kept me from falling. I grabbed the arm and looked up. “Coop. I know her. She — ” I stopped and looked again at the battered body, the blank eyes and slack mouth and remembered the last time I saw her. I looked away. “Sister Mattea Riordan. She’s a nun at DeMoss Academy. How could this happen? She was fine the last time I saw her.” An irrational wave of anger rose in me. What? Like the mere fact of seeing her alive a week or so ago made it impossible she was dead now? I gave my head an impatient shake, sending droplets of water flying off my hair and into Coop’s face. I gave him an incredulous look. He took off his HPD ball cap and ran his hand through short dark hair, a sure sign that he was irritated. I was a little irritated myself. After two months back in town, I still had a hard time accepting the ways of the local police department. Everything was on a need-to-know basis, and the chief’s point of view was that the paper never needed to know anything. I could rarely even get anything attributable to an anonymous source, because the department was so small it was easy for the chief to pinpoint a leak.